Once again Raihan plays teacher and evaluates the performance of the Bangladesh teams in the recently concluded tour by Zimbabwe. With yet another ZIM series under the rug, Bangladesh will embark on a short break before beginning a busy six months of cricket with the big gun. Â Below is a summary of the team performance in the Zimbabwe series, player by player. Tamim Iqbal: The captain called him out after game 1 and he made an attempt to answer. He had starts in 4 of the 5 matches including a flashy man of the match winning 80 but he continued to give his wicket away. Fresh off of a 300 run man of the match series in August, he came to the crease with high expectations and delivered here and there but not to his capacity. He did surpass Nafees in the BD ODI run list and sits at #5 behind Ash, Bashar, Shakib and Aftab. He finished as the 4rd highest run scorer at 135 behind Shakib, Masakadza and Taylor for the series, largely thanks to the knock of 80 in game 3. He is still the best opening option out there for Bangladesh and finding a consistent partner for him will rid Bangladesh a lot of headaches in the future. He does have to careful as similar things were said about Shahriar Nafees back in 2006. He scored around his average of 28 in the series, missing out on an opportunity to push that beyond 30. Despite chasing a low 44 in game 4 and returning at 8 down in game 5 after retiring hurt when all the hard work was done, Tamim still failed to secure a not out in this series. Tamim needs to set a goal to carry the bat for himself. 60+ innings with not a single not out is not a stat you want to have when you have set your sights on being a world class batsman. Junaid Siddique: Probably the only player in the team who is there more so because of failure of others than his own accomplishments. Disappointing throughout the series, he showed some flash in game 2 by scoring 23 in 11 balls only to give it away as a simple return catch to the bowler. With Nazimuddin, Aftab and Nafees due to end their ICL sentence before the next international commitment and the likes of Imrul and Rony showing promise as well as the potential for others in the current line up to be promoted to open, Junaidâ€™s fate as always seems to be out of his hands. Needing only 67 in the series to cross the 500 run mark, he still sits at 488 after 28 innings and like his partner no not outs. His 3 amazing catches in the final match at slip position was the most significant contribution to the team throughout the series. His partner (Tamim) and coach came out to his defense but he really wonâ€™t have any excuses if he is dropped going forward as he is the batsman all the way down to #8 to have an average less than 20. Mohammad Ashraful: One thing about this enigma who holds so many Bangladesh records is that he is consistently Mr. Inconsistent. 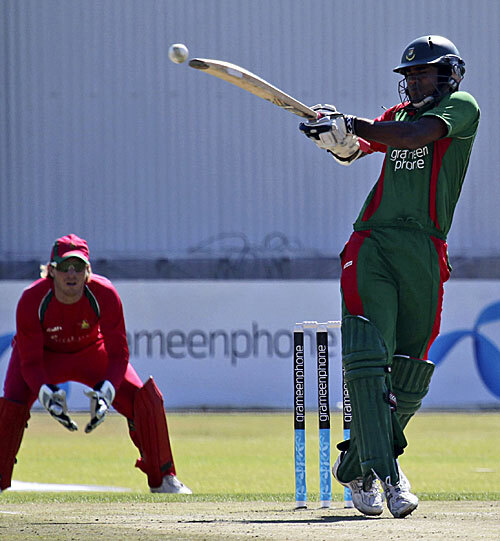 Ash played his 150th ODI in game 3 and with a Bangladeshi jersey in game 5. Without a plan with the bat in game one, handy with the ball in game 2, found rhythm with the bat in game three only to throw his wicket away and then got out to a duck with victory only 12 runs away in game 4. Game 5, with a healthy total to chase and into the crease early due to Tamim being retired hurt, he again disappointed. His dismissal seems to trigger the BD collapses and he continued taking the wrong approach in the media. Pretending he had found the magic formula after game 3 and implying the reckless shots are by crowd demand, Ash was back to his usual self with the bat in the last two ODIs. He did have a couple of nice catches and is now 1 behind Mash (32) in the all time catches list in ODIs for Bangladesh. Given his ability with the ball, it may not be bad to push him down the order to the Riad or Nayeem role and open up the top order to an ICL veteran or a new up and comer. With the exception of that his position in the role simply relies on the fond memories he provided in then newsworthy wins for Bangladesh. He has no business out there in the top order when so many others are hungry for it and he fails to deliver. Raquibul Hassan: Despite a slow approach that Gavaskar wouldnâ€™t feel hypocritical to make fun of, Raquibul seems to be slowly (no pun intended) cementing the #4 spot for himself. Add in the fact that he has to come to crease in order to consolidate wickets more so than step on the accelerator more often than not, one shouldnâ€™t really criticize him that much. He can play the anchor role great as he did in game 2 to allow Shakib to complete a whirlwind century. His fielding has also been good with him taking the important catches in each of the first 3 games. Held the nerve and sealed the emphatic game 4 with a six. He is the only other top order batsman beside his captain in the lineup averaging over 30. With players like Tamim, Shakib, Nayeem, and Ashraful around him to hit the big shots, he brings the stability to the lineup. He is no wall like Dravid but it turning out to be a rock that Bangladesh needs in its top order. Shakib Al Hassan: Another great series as batsman, bowler and captain. He should have had more wickets but poor keeping and fielding is to be blamed for that. He finally got his due in game 4 with a career best 3/8 in 6.5 overs and picked up 3 more in game 5 with some brilliant bowling. His low runs per over in the series was extraordinary. He made a statement century in game 2 after the ever familiar top order collapse not only for Zimbabweans but for his teammates as well. He showed composure in game three to see of 16 balls without a single boundary attempt after having to come to the crease against his wishes following an unnecessary 3 wicket collapse within a span of 4 overs for only 8 runs during a batting powerplay when the game was all but sealed. He also opted to not come out and bail out the team in game 4. Another 20 runs in game 5 saw him finish as the highest run getter with 143 runs (71.50 avg.) slightly over Taylor (141 @ 35.25) and Maskadza (140 @ 28.0). Bettering his avg. beyond 35, he crossed the 2000 run mark and will most likely become the 2nd highest ODI scorer for Bangladesh next year. He has already gone on record wanting to cross the 3K mark next year. He was vocal in his criticism of the team and introduced a new chapter in Bangladeshi captaincy in that just a win is not enough. He also surpassed Ashraful and became the 2nd most successful BD ODI captain and sits with an impressive 11-2 record. He didnâ€™t look deterred after a game 1 loss, but simply pointed out he had faith in the team to finish the series 4-1. Whether itâ€™s the intellect for the game, his form or just pure luck, he is doing it right. Mashrafe would be wise to step aside when he comes back and let Shakib continue as this seems to be working for the team at the moment. Sitting atop the ODI all rounder lists and being named the Wisden Test cricketer of the year he may want to look into a bigger house with a separate room will be required to hold all the awards that appear to be destined to come his way. Mahmudullah Riad: A fly on the wall for most of the series, he bowled only 4 overs in the first 2 games with no success but got a nice stretch in the 3rd game with 1/35 in 8 overs. Finally in game 5 he had a career best 3/52 with the ball and scored a crucial 33 to partner with Nayeem and set up the victory. He disappointed with the bat both times he batted prior to that. With so many other spin options available, there really doesnâ€™t seem to be a need for him in the limited overs setting. He could make way for a Kapali or Reza like player (a spinner with better batting skills or a medium pacer all-rounder) or even to Mushfiq as a specialized batsman. Mushfiqur Rahim: Very poor keeping throughout the series. 5 total dismissals in 5 games and more chances dropped/missed than made. Even simple takes were juggled or fumbled. The keeping is becoming more and more of a liability in the limited overs format. He could be considered as a specialist batsman in the team though. He had a nice half century in game 1 but lost his wicket swinging despite having 3 overs left when the same temperament that got him the 50 could have helped the team cross the 200 mark. Poor batting in game 3 as his constant walking in front of the stumps was an lbw waiting to happen. Saw off the chase of 44 in game 4 and had a quick cameo in game 5. Nayeem Islam: Didnâ€™t get that many overs to bowl but got two important breakthroughs in game 2. Finished off game 3 with a 2nd ball 4 with the bat after an embarrassing collapse and held his own in part of a 53 run stand with Mushy in game 1 (that too after an embarrassing collapse). Holed out for a duck in game 4 after being inserted early after yet another hair pulling out collapse but came back firing in game 5 with a personal best 73* and a man of match award. His hat trick of sixes in that match will be remembered by fans for a while. He showed composure in partnering with Riad and steadying the ship and then taking the wheel when batting with the number 11 when 37 runs were still needed. He too is averaging above 30 and it just feels like given an extended run at a higher order he could be more productive with the bat. Abdur Razzak: A great comeback series of sorts after the illegal action rehabilitation period. He became the first BD bowler to get a 2nd 5w haul and had BD back in the game with a 3 wicket over in game 1. He is quickly closing in on Mashrafe to become the top wicket taker for Bangladesh and sits at 133, only one behind. Opening the bowling alongside Nazmul by the 3rd ODI, he made himself a strong man of the series candidate pretty early on. He became the highest wicket taker (15 also a record for Bangladesh) in the series with ease. Dolar Mahmud : His game 1 blush saving innings of 41 gave him a selection into the 2nd game but his bowling, his real role in the team, couldnâ€™t save him going forward. His mediocre performance with the ball in game one (1/26 in 5) seemed better than it really was next to Rubelâ€™s horrendous performance and leaking 8 runs an over in game 2 would be the end for Dolar in this series. His knock of 41 was entertaining with 4 fours and 3 sixes and accounted for almost all of the partnership (54) with Mushy. Couldnâ€™t follow up his 4 wicket performance from the last ODI of the series in Zimbabwe and deserved the axe. Rubel Hossain : Masakadzaâ€™s wicket in game 1 wasnâ€™t enough to redeem Rubelâ€™s erratic bowling and he became the only casualty of the embarrassing game 1 loss. Probably unfair but he is a raw talent that probably isnâ€™t ready for trial by fire. His speed and ability to get the blockhole occasionally is promising and should be nurtured accordingly. Nazmul Hossain : Rubelâ€™s performance in game 1 brought him into the mix and by the time Dolarâ€™s performance was done in game 2, Nazmul was the lone pacer left standing. He didnâ€™t let his captain or the selectors down with a 3/13 performance in game 3. He followed it up the 4th ODI with a Man Of the match performance consisting of 2/10 and a stunning catch. No wickets in the final match but an amazing opening spell (15 runs in 7 overs) and finished the series strong economically. Bangladesh will hope he can be the compliment Mash will need upon his inevitable return? Enamul Haque Jr: Brought in to create a 6 spinner (!) attack in the 3rd ODI and delivered. Trusted by the captain as the only other bowler (besides Shakib himself in game 1) to complete the spell of 10 overs in the first 4 matches. He didnâ€™t disappoint and grabbed a career best 3/45. He followed up the next ODI by bettering it to 3/16 despite a 10 run over during the ZIM innings of 44. With questions remaining about the Bangladesh lack of pace, Enamul, Shakib and Razzak all seem to be capable of bowling while the ball is still new. Maybe a seam/spin opening combo can become the plan instead of improvisation upon necessity. The team seems to be destined for a glory era that has been anticipated desperately for the past three four years now. The base team to go into the 2011 world cup seems pretty steady and once the loose pieces are tightened (#2, #3, Keeping and Pace bowling), Bangladesh may be in position for some celebrations when they host their matches in less than 18 months. Some big seriesâ€™ lie ahead and with the ICL ban to be lifted prior to the next international endeavor, the pressure will be on for the current team to keep their place. About the author(s): Raihan Hannan is a Bangladeshi currently residing in Georgia USA as an IT professional but still follows cricket on a regular basis. His love for cricket grew as a child growing up in Australia. He goes by the nick Raynman on our forum. This page has been viewed 7038 times.